Composting is beneficial to both you and the environment. Read on to find out about the major benefits of composting! –Composting improves soil. The nutrients from compost can regenerate poor soils and encourages the production of beneficial bacteria and fungi, which break down organic matter and creates humus. Hums increases the nutrient content in soils and helps it to retain moisture. –Composting prevents pollution. By composting organic materials, you are keeping them out of landfills where they can contribute to the production of methane and leachate, which are both harmful to the environment. Compost can also prevent erosion and pollutants in storm water runoff. –Composting leads to economic benefits. Composting reduces the need for water, fertilizers, and pesticides. Composting is also a low -cost alternative to landfill cover and artificial soil amendments. 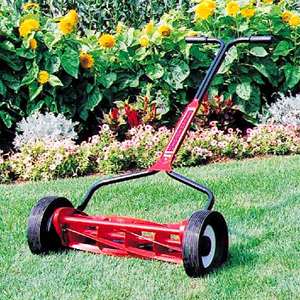 Silent Cut Mowers: Shipping Later this Week! The Silent Cut Mowers, which have been placed on back order, have just arrived at the port in New York and are expected to be shipped to customers later this week! -Take the handle off and pull it apart by about one inch at the bottom where it fits over the bolts. -Reattach the handle (slide back over the bolts) and the increased tension will keep the handle from becoming disengaged. New to PPM: The Nature Zap Weed Killer! Check out the new Nature Zap Weed Killer, providing a greener way to weed with no harsh chemicals. The Nature Zap allows you to grow the plants you want and kill the weeds you don’t want. The Nature Zap is also ideal for gardeners with back, knee, or joint pain because the long handle reduces strain on the body. -Uses thermogenic (heat) energy to stop normal plant functions and kill the weed at the root. -All you do is place the Nature Zap over the weed you want to get rid of, push down, apply the heat. -You apply 3 seconds of heat for smaller weeds and up to 8 seconds for larger ones. People Powered Machines is now on facebook! To view our page click here. You can check out the latest news about products, be the first to hear about sales, ask questions, and see pictures of all our products! 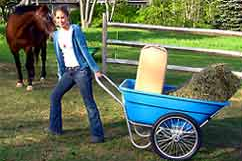 Sick of buying a new wheelbarrow every few years? 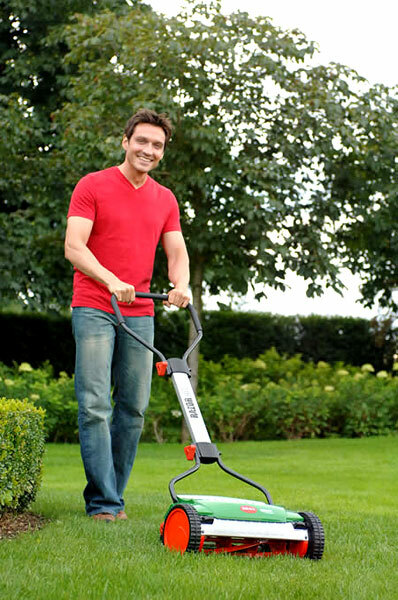 Sick of buying a new wheelbarrow every few years: Check out the Smart Cart wheelbarrow…it might outlast you. The Smart Cart is the perfect wheelbarrow. Its aluminum frame is lightweight yet durable. The heavy duty loading pans or tubs come in 7 cubic feet or the larger 12 cubic feet. Hard to believe such a light cart can carry so much, so easily. Every day use: We use ours almost every day for taking care of the horse. But also we use the Smart Cart for other daily activities such as gardening, weeding, hauling fire wood, lawn repair, moving compost, bringing recycling to the curb, carting brush, carrying fill, and carting stones of all sizes. The capacity is up to 600 pounds! both the 7′ tub and the 12′ tub as both fit on the same frame. Wheel options: You have four wheel options. There is a 20″ spoked wheel and a 16″ turf tire. Both sizes come in a flat-free option. Fiskars Momentum: For the second time this season the Fiskars Momentum has sold out of supply. Fiskars estimates they’ll begin shipping again on June 15. Fiskars Throws Forwards: The Fiskars Momentum throws the grass in front of the machine. This seems to work fairly well except when the grass is high. If the grass is high you need to turn the machine off path to get free from the grass build up and then continue mowing. Bagger Coming: At this point Fiskars does not offer a Grass Catcher. But we are being told by the Fiskars folks that a Grass Catcher is in their plans.